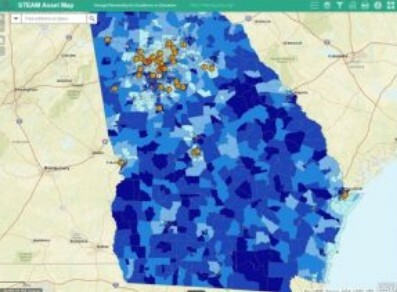 This map is part of a Georgia Partnership Project, EdQuest Georgia. Schools: Information on all Georgia public schools, including demographic information of the school and neighborhood, student achievement in STEM fields, and whether those schools have been STEM or STEAM certified by the Georgia Department of Education. Out of School Opportunities: Opportunities for students to participate in STEM or STEAM activities outside of school, including where these activities are located and when they take place. These opportunities were reported by partner organizations and through self-reporting, and we present them with no judgment as to the quality of each. Please contact individual programs for more information. Grants: Philanthropic investments in STEM and STEAM throughout the state. Information on philanthropic and state investment into STEM and STEAM education was collected through surveying known Georgia grant-making institutions and researching investments through public databases.